Jerky is a great way to preserve meats. That said I have never seen a large batch of jerky last for more than a couple of days in my home. Preparing jerky in a smoker, rather than a dehydrator or oven, takes the flavor to a whole new dimension. Because jerky requires a low and slow cooking method, the amount of smoke is not so high that it overpowers the taste of the meat. A lower temperature means that you also don’t have to babysit the smoker all day to replenish the wood chips every 45 to 60 minutes. Just be sure to keep the vent open 100% to encourage the smoke to circulate. Most of the jerky I have made has been from lesser cuts of beef. Beef is easy because it doesn’t have to be cooked all the way through to avoid any chance of a food borne illness. Game meats, such as elk, caribou, and venison are similar to beef. Fish, such as salmon, also works well for the same reason. Poultry and pork are a little trickier in that they do need to be cooked all the way through. We’ll focus on beef, game meats, and pork in this article. While you don’t want jerky that is completely dry as a bone, I recommend marinating your protein before smoking it. After it has marinated, let it smoke for a few hours on low heat to make sure it is cooked all the way. With beef, you may opt to skip the marinating process and just use your favorite dry rub. This results in a crispier texture. In these recipes we will aim for a finished product that is cooked through, steeped in flavor, and still slightly pliable – not a tooth breaker. Marinate or dry rub the protein first. Line the drip pan and water pan with aluminum foil for easy clean-up. Lay the protein directly on the smoker grates, not a sheet pan. Leave some air space between strips of protein. Soak the wood chips for approximately 60 minutes before smoking. Smoke most meats between 165 and 185 degrees Fahrenheit. Check at 2 to 3 hours and every 30 minutes after that, depending on the protein (see recipes). Add more wood chips if necessary every 2 to 3 hours. Store jerky in a sealable bag or glass jar in the refrigerator or freezer. 1. Place the London broil in the freezer for approximately 30 minutes. Meanwhile, make your marinade: Combine all of the other ingredients, using only 1/2 of the beer in a large baking dish. 2. Slice the semi-frozen beef into 1” wide x 1/4″ thick strips. Place these in a baking dish and cover with the marinade. Cover the dish and place it in the refrigerator for 4 to 8 hours, or overnight. You can also do this in a sealable plastic baggie. 3. Remove the beef strips from the marinade and pat them dry with paper towels. 4. Remove the racks from the smoker and layer the beef on as many racks as you need, leaving a little air space around each strip. Fill the water pan with the remaining beer and some water to bring it to 1/2 full. Add wood chips to the bottom tray. Turn the smoker on to 180˚F and set the timer for 3.5 hours. Place the racks with beef in the preheated smoker. 5. Check the wood chips and liquid at 2 hours. Add more if needed. 6. Allow the jerky to cool on the racks. Store in the refrigerator, or eat immediately! If you want to spice up your beef jerky, you can use the basic recipe and add I to 2 TBS of your favorite hot sauce to the marinade. Or, mince a couple of whole red Thai chili peppers and add to the mixture. Remember to pat dry meat before smoking. Elk is a super lean meat. It does help to pound the meat flat and marinate it with a bit of acid to soften the muscle. This recipe calls for orange juice to help break down the muscle fibers. 1. Blend all of the marinade ingredients together in a large baking dish or sealable baggie. 2. Slice the elk against the grain into 1” wide x 1/4″ thick strips. Pound it a couple of times with a mallet just to loosen the muscle fibers. Place the meat in the marinade, cover, and refrigerate for up to 12 hours. 3. Remove the racks from the smoker. Pat the elk dry with paper towels and lay the strips on the racks with air space between them. 4. Preheat your smoker to 165 degrees Fahrenheit. Fill the pan with water. Add the soaked wood chips to the chip tray. 5. Place the grates with meat into the preheated smoker. Smoke for 4 to 6 hours. The meat should be firm but not completely dried out. Check the water pan and chip tray at 2.5 hours and add more of each if needed. Venison is like elk in that it is very lean. The recipe here uses wine and sugar to break down the muscle fibers. 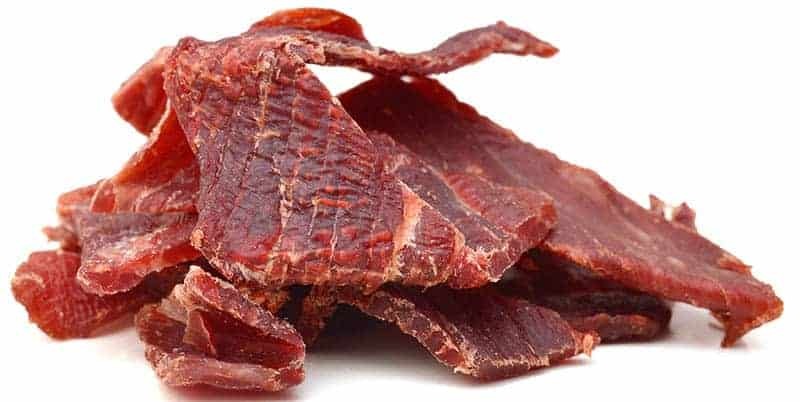 If you are feeling adventurous, you can grind the venison (or buy it ground), marinate it, and form it into thin, flat strips to make a softer jerky. Frankly, I don’t have the equipment or patience to work with ground meat. I think ground meats work much better in a dehydrator than a smoker. 2. Slice the venison against the grain into 1” wide by 1/4″ thick strips. Pound it a couple of times with a mallet just to loosen the muscle fibers. Place the meat in the marinade, covered, and refrigerate for up to 12 hours. 3. Pat the venison dry with paper towels and lay the strips on the racks that you have removed from the smoker. 4. Preheat your smoker to 165 degrees Fahrenheit. Fill the pan with 1/2 water and 1/2 apple juice. Add the soaked wood chips to the chip tray. 5. Place the grates with the meat into the preheated smoker. Smoke for 4 to 6 hours. The meat should be firm but not completely dried out. Check the water pan and chip tray at 2.5 hours and add more of each if needed. I love smoked pork chops. They cook low and slow and retain their moisture. I have to admit that I never tried to make jerky from pork. My hesitation is that I feel it needs to cook a long time so it will be safe to eat but might be dried out. In fact, I had never eaten pork jerky. Pork is tricky in that it can be perfect one minute and cardboard one minute too long. I did a lot of research on pork jerky and all of the recipes left me feeling like I was in for a long day of babysitting the smoker. Many pork jerky recipes call for using ground pork that has been pre-cooked in the oven. I just didn’t see the point of all that work. I finally found a recipe that I could play with that seemed to make sense in both the preparation and the cook time. I have to give credit to the Girls Can Grill website for the recipe that I used as my inspiration. These ladies (and men) embrace grilling and smoking hailing from their southern roots. The recipe that inspired me uses sweet tea, a staple of the southeast US. You can make your own or buy it premade. Perhaps the tea acts similar to a brine for the pork. I have linked to a homemade tea recipe. 1. Trim any fat and silver skin from the pork loin. Slice it into 1/4″ thick, or thinner, pieces. Place the pork in a sealable baggie. 2. In a bowl or pitcher combine the marinade ingredients. Pour into the bag and seal it tightly. Massage so that all the pork is well coated. Place the bag in a baking dish (in case it leaks) and refrigerate overnight. 3. Take the bag out and allow it to come to room temperature, approximately 30 minutes while you soak your wood chips and prepare the smoker. Preheat the smoker to 180˚F. Add 1/2 water and 1/2 sweet tea to the water tray. Add the wood chips to the side drawer. 4. Meanwhile, remove the pork from the bag and pat dry with paper towels. Place the slices on the smoker racks with air space between each. Close the door of the smoker and let it go for approximately 1-1/2 hours. 5. At 90 minutes, check the water tray and wood ships. Add more sweet tea and chips if necessary. Smoke for another 60 to 90 minutes and check for dryness. You want the pork to be completely cooked through but not totally dried out. It should still have a small amount of flexibility so that it bends when handled, rather than breaking. If the pork isn’t cooked through, keep it in the smoker and check on it every 30 to 60 minutes. This recipe may take a little trial and error. I have saved the best for last in this series of meat jerky recipes. I would eat this for dessert. It is a snack that will disappear, so make plenty of it. Most of my recipes call for 1 pound of meat that you can adjust accordingly. With this recipe, I recommend making 2 to 3 pounds of smoky, candied bacon if your smoker is large enough. Most bacon is already cured or salted and seasoned, so you really don’t have to marinate it. You can apply the flavorings and put it directly in the smoker if you like. I think letting the bacon sit overnight in syrup and spices does make it a little tastier. This recipe does not call for exact quantities. You simply sprinkle and drizzle the ingredients over the layers of bacon. Remember that bacon if fatty. So, line your water and drip trays with aluminum foil for easier cleanup. 1. In a baking dish, place a layer of bacon pieces. Drizzle or brush on some maple syrup to lightly coat. Add a dusting of garlic and onion powder. Then, sprinkle a pinch of cayenne. Flip the fist layer of bacon over and add the same ingredients. Add another layer of bacon, syrup, and seasonings. Repeat until all the bacon is in the dish. Cover and refrigerate overnight. 2. Take the grates out of the smoker. Fill the water bowl half way. Place chips in the tray. Preheat the smoker to approximately 225˚F. 3. Layer the bacon the wire racks, leaving a little room between each slice. Sprinkle with brown sugar. (This is a little messy, so be prepared to clean up sugar on your work surface). Place the racks in the smoker and open the vent. Smoke for 1 hour. 4. Remove the racks and flip the bacon over. Sprinkle the other side with brown sugar to coat. Smoke for one more hour until the bacon is brown and dry, but not crunchy. You may have to keep an eye on this and adjust the timing to get it properly cooked and to the texture you enjoy. Do u have to use the water when u smoked the finished marinated jerky. can u smoke it without the water in the pan. in my other smoker I didnt use the water. I would not use water as you are trying to remove moisture to make jerky. Question… I made some ground beef jerky strips with a LEM Jerky Gun. Smoked it for 3 hrs and it’s pretty decent, I want to also dehydrate some and compare to the non-dehydrated version. Any tips on regular smoked non-deydrated ground beef jerky strips vs a deydraed version? Going to try some of your full beef chunks instead of ground with a marinade, of course I will dehydrate these. what do you do if making 5 pounds of jerky do u increase ingredients five times? Your recipe for the beef jerky says this one an electric smoker. Is recipe and methods that same for a Masterbuilt propane smoker? Thank you. This recipe should work just fine also on a propane smoker but I have tried it only using an electric smoker. If you try it on a propane smoker, please report back how it went. You say to open vent 100% when smoking jerkey. My master built electric smoker does not have o vent. What now? How do I get the smoke to flow thru the smoker now? Only venting is around door seal. My MES doesn’t generate smoke at that low of a temperature. I always have to start at 200 or so for an hour of smoke before I turn the temperature down to 160 in order to dry out the meat.